Lucy Hopman, the widow of Australian tennis great Harry Hopman, passed away on 31 August in Florida at the age of 98. The Hopman Cup is named in honour of the legendary Harry Hopman, Australia’s most successful Davis Cup captain of all time. Her final visit to Perth was in 2014 at the age of 93. During her speech when presenting the trophy to Team France she once again pronounced Perth her “second home,” reminding the players and the fans of her and Harry’s deep attachment to one another. Lucy was born in Bass Rocks, Massachusetts on 27 July 1920, the daughter of Ralph Linder Pope and Elizabeth Wightman Pope. In 1971 Lucy married Harry Hopman, a three-time Davis Cup champion as a player and 16-time champion as captain of the Australian team. He had moved to the United States and become a professional tennis instructor. Lucy and Harry spent the early 1970s on Long Island, where Hopman oversaw the early training of John McEnroe, Vitas Gerulaitis, and Mary Carillo at the Port Washington Tennis Academy. In 1975, the Hopman’s moved to the Gulf Coast of Florida, where Lucy put her organisational skills to good use helping to manage the Harry Hopman International Tennis program, first at Treasure Island and then at the Bardmoor Resort in Largo, Florida. On Bardmoor’s 40 courts Harry trained standout players from around the world, including Andrea Jaeger, Jim Courier, Jennifer Capriati and Ramesh Krishnan. When Harry died in 1985, his tennis camp relocated to the Saddlebrook Resort in Wesley Chapel and Lucy took up her three-decade quest to keep his name and legacy alive. 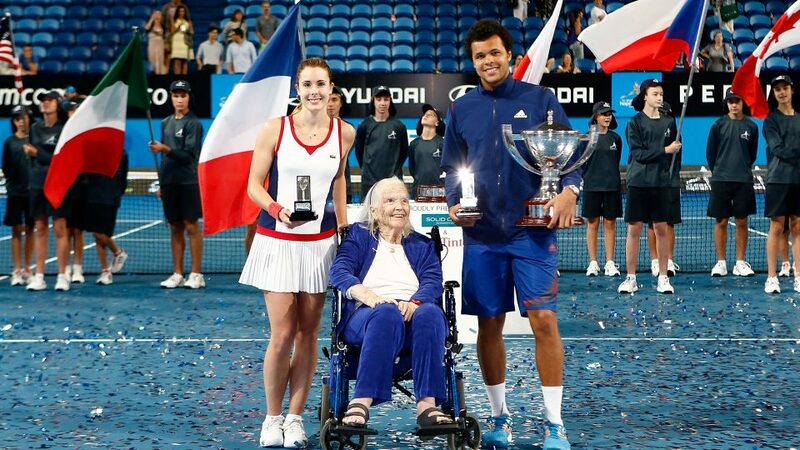 Mastercard Hopman Cup Tournament Director Paul Kilderry paid tribute to the late Lucy Hopman. “We pay tribute to Lucy Hopman, Harry’s beloved wife who passed away on Friday at the age of 98,” Kilderry said. ITF President David Haggerty added, “It was with great sadness that we learnt of Lucy Hopman’s passing. Lucy Hopman is survived by her son Richard (her son David passed away in 2016), three grandchildren, and six great-grandchildren. Donations in her name will be gratefully accepted by Andrea Jaeger’s Little Star Foundation. Andrea’s spirited work with stricken and disadvantaged children had long touched Lucy’s heart, as it had many of Andrea’s fellow players. Contributions can be made online at www.littlestar.org.